Home / annual singles dating survey / Annual Singles Dating Survey 2018 Reveals that…. Lunch Actually today released findings from its Annual Singles Dating Survey 2018 – that was conducted with 1,300+ singles living in Singapore, Malaysia, Hong Kong, Indonesia and Thailand. 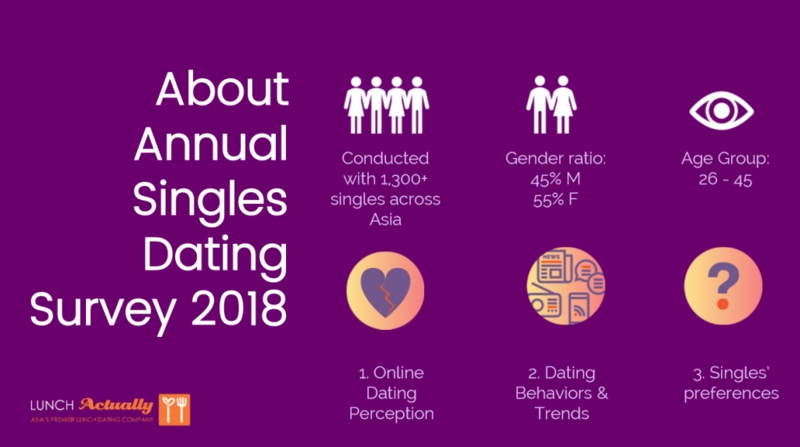 The dating survey captured interesting data and trends on shifting perception of online dating, attitudes and trends around online dating, as well as dating goals and preferences in this age of technology and social media. 74% of respondents believing that online dating is the cause of today’s hook-up culture and 46% believes that online dating has killed committed relationship. Having said that, 95% of singles surveyed still want to be in a committed relationship, and 92% are looking to get married. 75% of those using online dating are indeed looking for a true relationship, although more than half admitted that their online dating experience has been negative, especially for singles surveyed in Singapore, 69% for ladies and 61% for males. 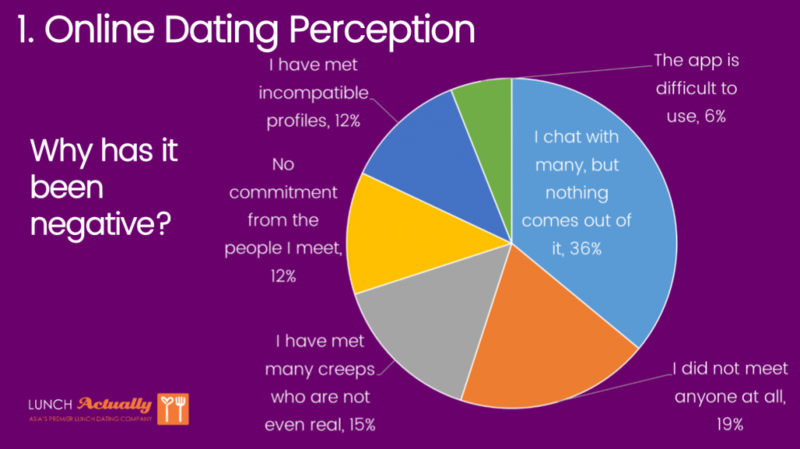 Interestingly, the top reason for this negative experience for male is “meeting many creeps who are not even real” (33%), while the top reason for female is, “chatting with many matches but nothing came out of it” (35%). For those who have not even used online dating, their top reasons for not using it are: worried about meeting scammers (61%) and having heard a lot of bad experiences from other people (37%). While 70% of singles have used online dating before, 61% of them still highly prefer to meet potential partners through organic introductions (in public places or recommendations from friends.) This is true across all genders and countries. 43% prefers to meet potential partners offline. 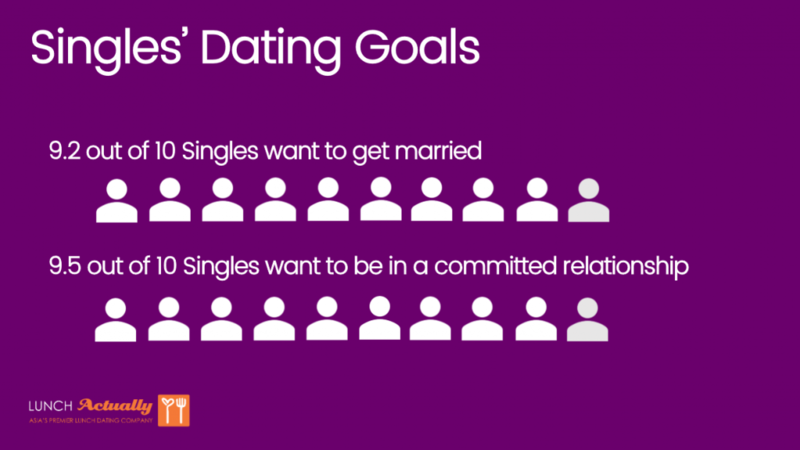 There’s also a gap between how singles behave in online dating vs their expectations from other singles. Overall, only 18% of singles spend time to create a good profile on dating apps, but 60% admitted to read other dating profiles in details, to decide whether they are interested. 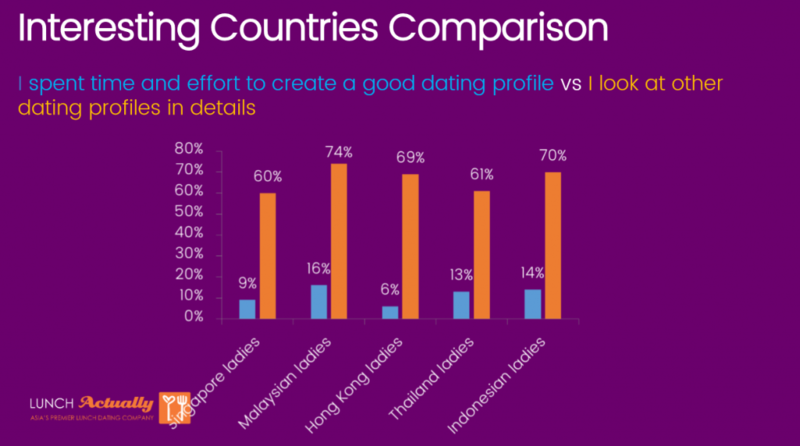 This statistic is most extreme with Hong Kong ladies – only 6% of them spend time to create a good profile, but 69% read profiles of the men in details. 40% of Singaporean females do not text first, while the number is 34% for Malaysian females. 64% of Hong Kong females, on the other hand, take initiative and would text their matches first if they like what they see. They are the most proactive in online dating! When it comes to online dating, women are as likely as men to focus on physical attraction. This dating survey shows that ladies choose physical appearance (height, body type, teeth, skin color) as the most important criteria when they decide whether to meet their match offline. While texting etiquette is more important for ladies, men are more focused on the dating profiles of the ladies. However, an exception can be seen in Malaysian singles who do not rank physical appearance as the most important criteria. On the opposite spectrum, 45% of single men in Hong Kong place this as the most important. However, once you get past the online dating funnel and you meet in real life for the first time, the top 3 turn-offs are not about how you look at all. These are the top 3 turn-offs when it comes to first dates: Their manner (how they treat you and the service staff) (67%), being negative (50%), and lack of interest (48%). These are the same results for both men and women, across all countries. 66% of singles is open to dating people from another race. However, the exception to this is Malaysian female with 53.66% of them saying no to dating people from another race as compared to Singaporean female (42% says no) and Hong Kong Female (37% says no). Most open to interracial dating are Indonesian female (94%), Thailand female (91%) and Thailand men (86%). Overall, more female (34%) believe in going Dutch on the first date as compared to male (25%). Noteworthy result comes from Hong Kong, where higher statistics were observed with 41% of male and 45% of female prefer to go Dutch on the first date. Thailand men are the most ‘gentleman’ with the highest percentage (61%) who believe they should pay on the first date. Having said this, some singles are also more comfortable with their single status – despite majority wanting to get married and be in a committed relationship, 20% of them are not actively looking for a partner and 29% of those who are not actively seeking have cited that they like being single and they are embracing their freedom (29%). This is especially true for Singaporean females where 49% of those not actively looking for a partner as they enjoy being single. With the shift of online dating perception from the swiping culture to slow dating, it is not surprising that more singles highly prefer a more organic way of meeting potential partners through organic introductions e.g. meeting in public places or recommendations from friends. “One of the key reasons why singles like using online dating is because it’s easy and comfortable to use and it’s free and requires no commitment. Based on the dating survey results, many singles are actively looking and swiping online. Interestingly, they are not interested in investing much time or effort in preparing their profile, but they expect others to as many of them spend time reading the profiles,” Violet shared.